When Liverpool played Arsenal back in early November, Unai Emery’s side were riding the crest of a wave during an impressive unbeaten run and proved formidable opposition. Liverpool led the game through James Milner, but ultimately had to settle for a draw after Alexandre Lacazette’s late equaliser for the hosts. That day, Arsenal matched the Reds and a point apiece was probably a fair reflection of the contest. However, since then Liverpool have grown significantly and stepped their performances up to a whole new level. Jurgen Klopp‘s midfield was badly exposed on numerous occasions at the Emirates, but here they largely controlled the game well—several sloppy passes aside—with Gini Wijnaldum, in particular, delivering a magnificent individual display. The fact that Pierre-Emerick Aubameyang only touched the ball six times in the first half, four of them coming from kick-offs, was evidence of how little Arsenal were able to find their most influential player. 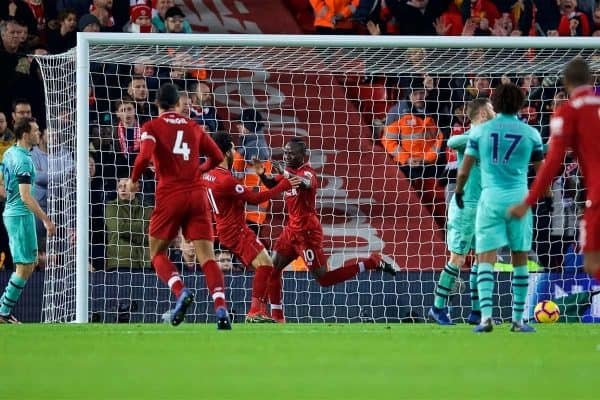 Offensively, Liverpool were ruthless in taking advantage of the Gunners’ defensive frailties and were able to showcase their superior quality in hugely impressive fashion. 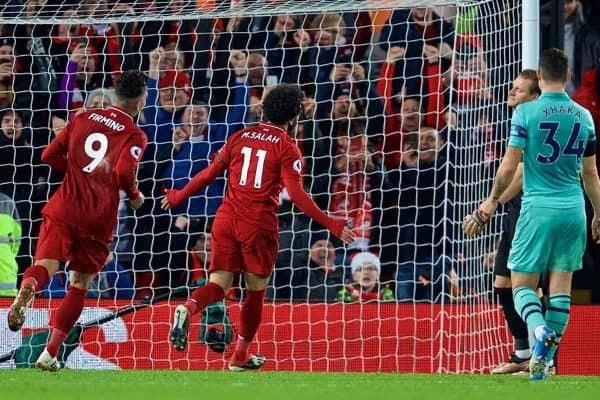 The manner in which Klopp’s team managed to hold their nerve after conceding a rare goal at Anfield—just the third goal conceded in the league at home this season—showed the mental strength and confidence of this Liverpool team, responding immediately to go 2-1 up within five minutes of falling behind. There was never a sense of panic, rather an aura of calm despite the early setback. Liverpool have come an awfully long way since November and played in a manner befitting of a side setting the pace at the top of the league. Roberto Firmino has endured a frustrating season so far and at times has struggled in adapting to a new, slightly deeper role. 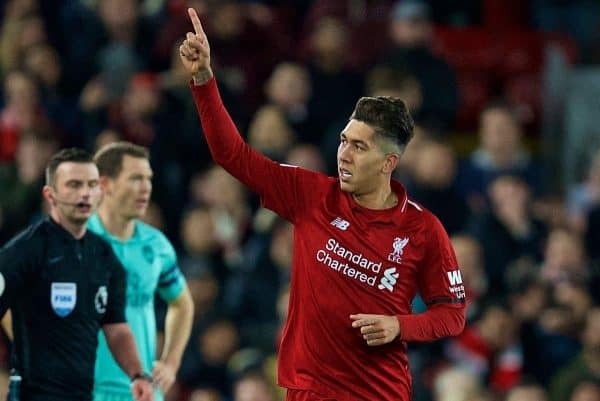 There have been signs of Firmino finding his feet again of late, however, and here he delivered by far his finest performance of the season, proving the difference-maker as Liverpool recovered remarkably quickly to take the lead after Arsenal’s early goal. 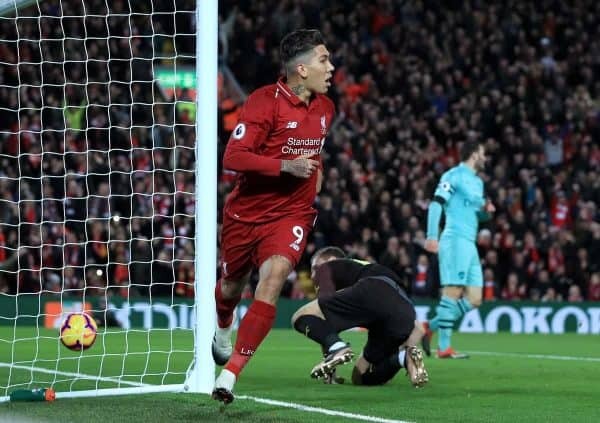 The first arrived in somewhat fortunate fashion, following up on a loose ball after Arsenal had failed to clear inside their own box, but it came after Firmino had driven through the middle of the pitch to create the opportunity. Naturally, he took the opportunity to produce yet another trademark ‘no-look’ finish as he rolled the ball into an empty net. 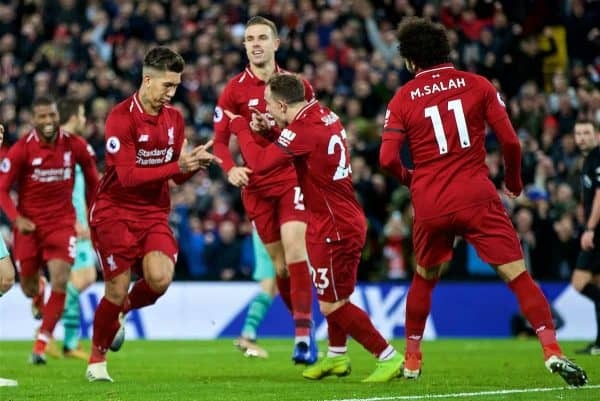 The second was simply sensational, as Firmino danced his way through the Arsenal defence leaving Sokratis, Shkodran Mustafi and Lucas Torreira in his wake before coolly slotting past Bernd Leno on his weaker foot to put Liverpool ahead. He was heavily involved throughout, dropping deep to link play, win the ball back and get himself into scoring positions in the penalty area. The Brazilian’s magnificent afternoon was capped off with his first-ever Liverpool hat-trick, clinically dispatching a second-half penalty as Salah generously passed over spot-kick duties. If Firmino can maintain this kind of form and continue to produce performances of such a high calibre, it will make a huge impact for Liverpool heading into the second half of the season. Prior to Boxing Day, Liverpool had gone 424 days without winning a single penalty in the league at Anfield. It was quite an absurd statistic, given the tricky players Liverpool have and the proportion of most games where they spend time in the opposition penalty area. Following Salah’s somewhat controversial penalty against Newcastle, Liverpool then received another two here against Arsenal, making it three penalties in a week after over a year without any. The first was a blatant foul on Salah by Sokratis—and the Egyptian duly converted with a powerful strike down the middle—but it was the contribution of Alisson which deserves recognition for his role in the build-up to the incident. Liverpool’s goalkeeper has directly contributed to several goals already this season, most notably against Fulham and Burnley, and here he sent a quite sensational driven pass to Firmino in space on the right flank. Firmino then found Salah, who was brought down in the box, but Alisson’s pinpoint distribution was what created the situation to win the penalty. Another arrived in the second-half as Dejan Lovren was adjudged to have been pushed inside the box by Kolasinac, which saw Firmino seal his hat-trick in front of the Kop. The fact that Liverpool are now seemingly winning penalties again at home can only be a huge positive, and as Liverpool’s last major title challenge in 2013-14 showed, winning regular spot-kicks when the pressure is on is a very healthy habit. Liverpool’s latest victory means they now have a 10-point lead over Man City before Pep Guardiola’s side face a resurgent Southampton on Sunday afternoon. It’s a scenario which scarcely seemed possible only a few weeks ago, but Liverpool’s performance levels have not dipped; if anything, they’re continuing to get better as the season progresses. Ever since Divock Origi’s last-gasp derby winner, Liverpool haven’t looked back and have won every single fixture throughout a perfect festive period. Meanwhile, the external context of the title race has seen Man City losing to Chelsea, Crystal Palace and Leicester, losing major ground and suffering a mini-crisis as their defence has started to show regular cracks. Tottenham, on the other hand, emerged in second place on Boxing Day but fell to a surprise 3-1 defeat at home to Wolves prior to Liverpool’s clash with Arsenal. Whereas in the past fans have bemoaned Liverpool’s tendency to not take advantage when their rivals have slipped up, this time around Liverpool are intent on extending their lead and ramping up the pressure on both Man City and Tottenham who are now playing an increasingly difficult game of catch-up. 2018 has been a remarkable calendar year for Liverpool, with the Champions League final defeat in Kyiv representing just a blip in an otherwise incredible year of progress for Klopp and his team. 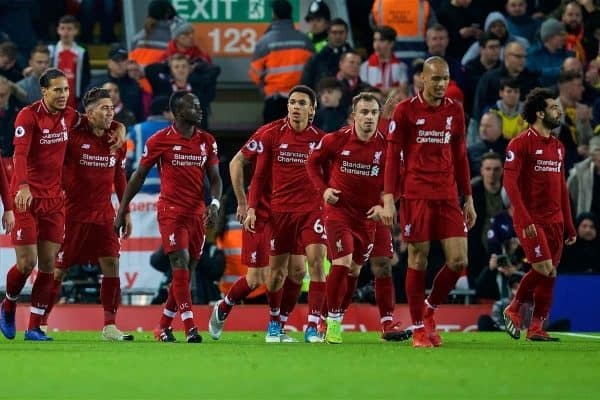 This season, we’ve seen a more mature and efficient Liverpool side with the best defensive record in the league, with only eight goals conceded in 20 games, and a forward line which has clicked into gear over the past couple of months. The haul of 54 points after 20 games is a club record and sees Liverpool on track for a quite phenomenal points tally, should they continue at the current rate. Signing off the calendar year with an emphatic victory over Arsenal was crucial in terms of keeping the momentum going into 2019 and heading to the Etihad for a clash which will, regardless of the result, see Liverpool maintain a cushion at the top of the table. Dispatching an Arsenal side which have received plenty of plaudits this season for their attractive attacking football under Emery in such ruthless fashion, without ever having to reach top gear, was the perfect way to finish the year. This is a title challenge built on solid foundations, not a flash in the pan, and this latest win was a booming statement of intent for what promises to be an enormously exciting second half of the season for the Reds.